In the mid 1940s, the Koch family opened Santa Claus Land in Santa Claus, Indiana. 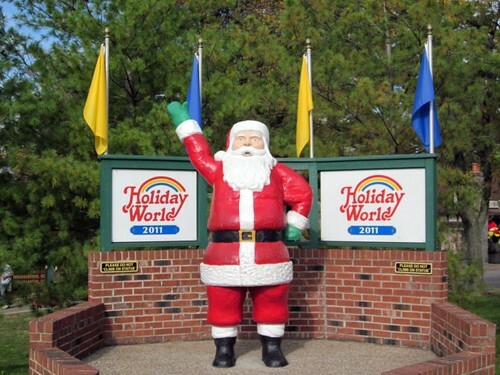 Since that time, the name has been changed to Holiday World and the park has grown to not only a Christmas themed section, but also Halloween, Fourth of July and Thanksgiving themed areas. 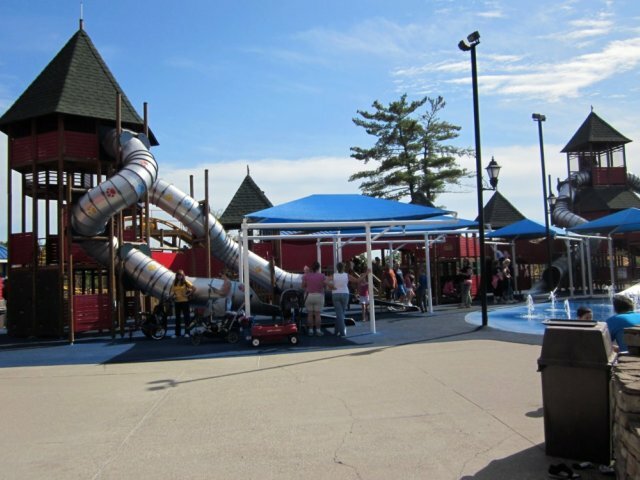 They also have a highly rated water park named Splashin’ Safari that is open during the summer. One thing that has remained constant is the Koch family at the reigns. 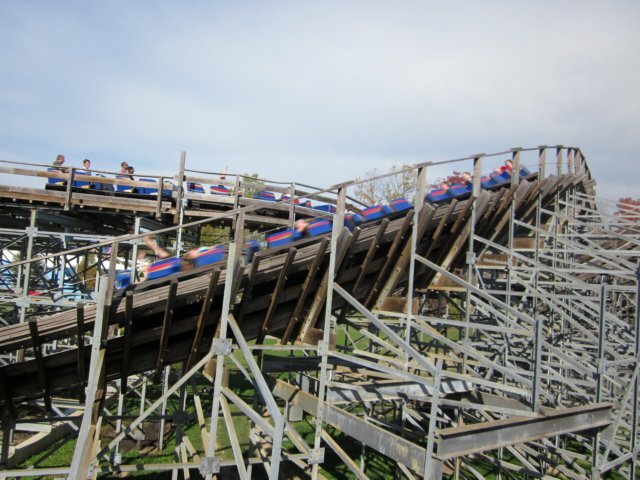 I first heard about Holiday World a few years ago from coaster enthusiast friends telling tales of the awesome and intense wooden coasters that have built there. 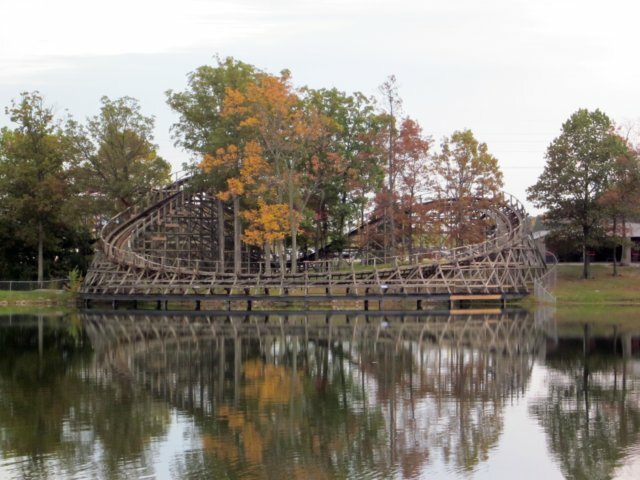 I have wanted to visit the park ever since, and finally got my opportunity this past weekend. 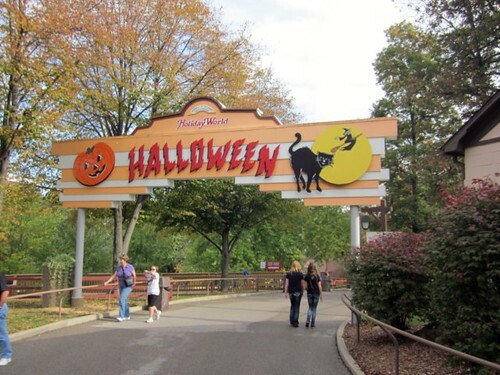 Please join me as we journey through the park. 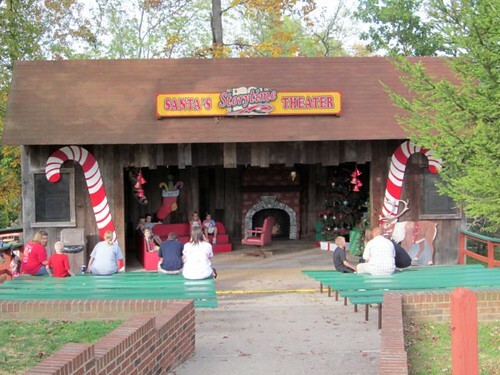 The main entrance of the park remains in the tradition of the original park and is themed around Christmas. 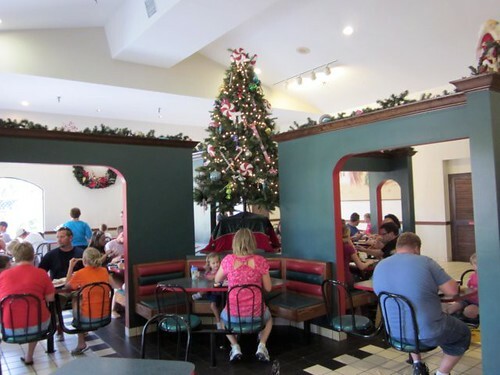 This includes the decor of the restaurant in this area, Kringle’s Kafe. It’s always Christmas in this part of the park. 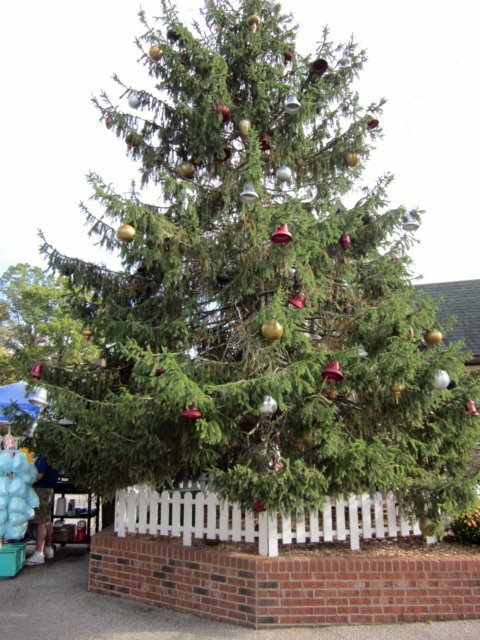 Don’t be surprised to hear one of the friendly staff wish you a Merry Christmas. 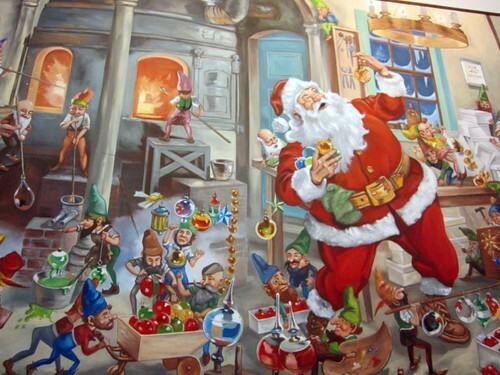 It’s not Christmas without a story from Santa himself, is it? The kids are anxiously awaiting the appearance of the jolly old man, but I needed to move on. There were coasters calling my name. Can’t you hear them? 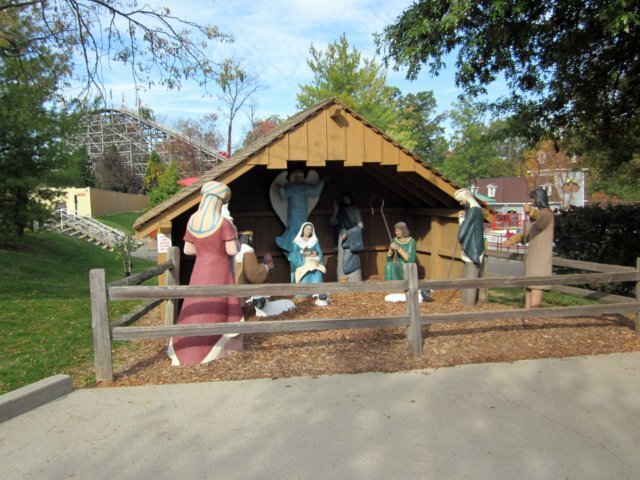 I applaud the Koch family for including a display dedicated to the display of the true meaning of Christmas. Speaking of applause, Holiday World &amp; Splashin’ Safari has won the prestigious Liseberg/Amusement Business Applause Award and built a fountain near the front of the park in honor of it. 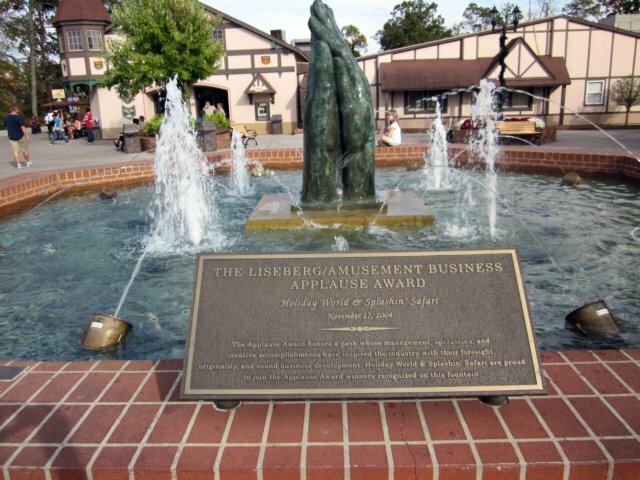 You can learn more about the award here. In this part of the park you will also find Rudolph’s Reindeer Ranch, a selection of rides for the younger guests. 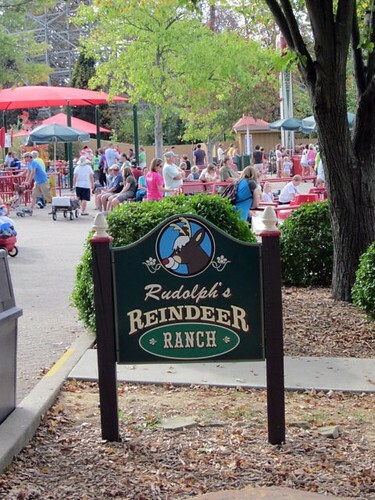 Just past Rudolph’s Reindeer Ranch is the Halloween themed section. 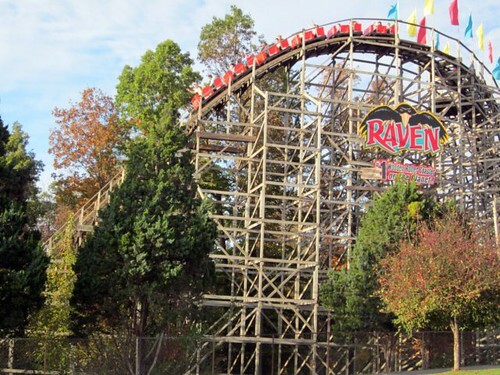 Here is where I got to ride my first coaster of the day, The Raven. 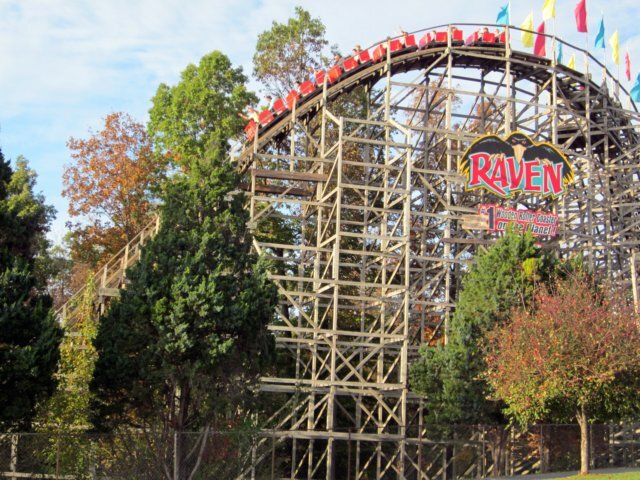 The Raven was built in 1995 by Custom Coasters International and continues to be a thrilling ride. While the ride is surprisingly short, it packs a lot of punch in 2800 feet. This is the view of The Raven across Lake Rudolph from the campground we were staying at. From this view of The Raven’s train in the station, you can see the small lockers in the back corner. You will note that they are available for your use at no charge. Put your valuables inside and take the key. 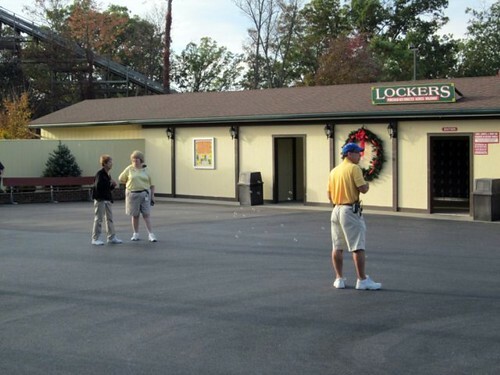 When you return, remove your valuables and leave the locker empty for the next guest. 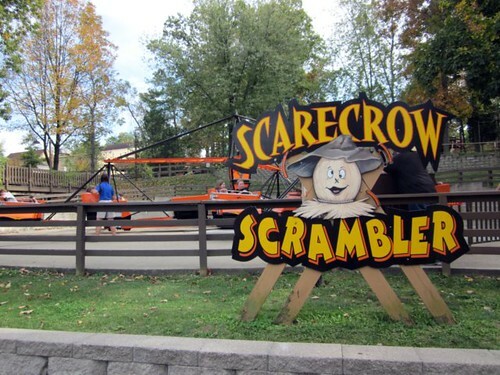 Not far from the entrance to The Raven is the Scarecrow Scrambler, a standard scrambler with festive fall colors. Close by are the HallowSwings, a great family ride. Also in the Halloween section you will find their water flume, Frightfall Falls. 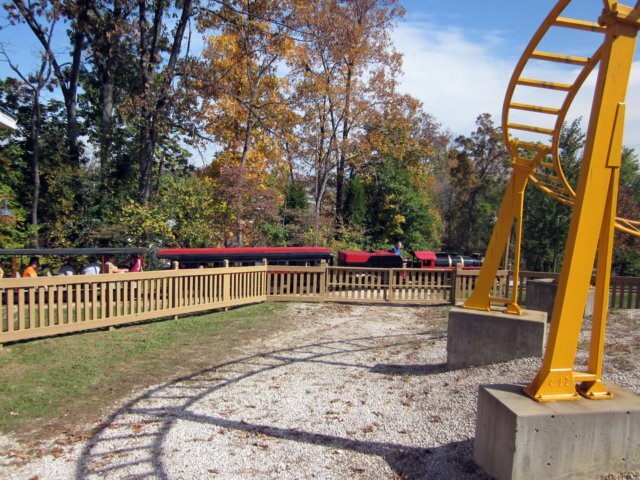 I enjoyed the unique tunnel on the ride. I won’t tell you any more; you should experience it for yourself. 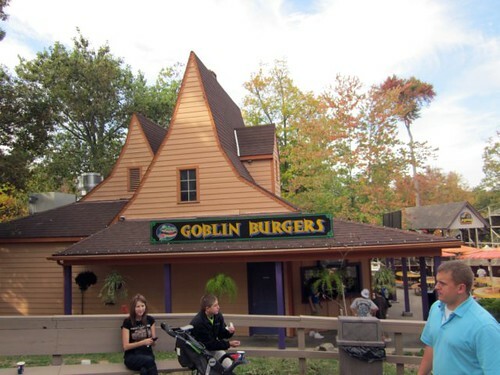 Even the restaurants and food stands haven’t escaped the theming. The music (that I haven’t shown here) is also themed to the area of the park that you are in. All of a sudden you turn around and what do you see? 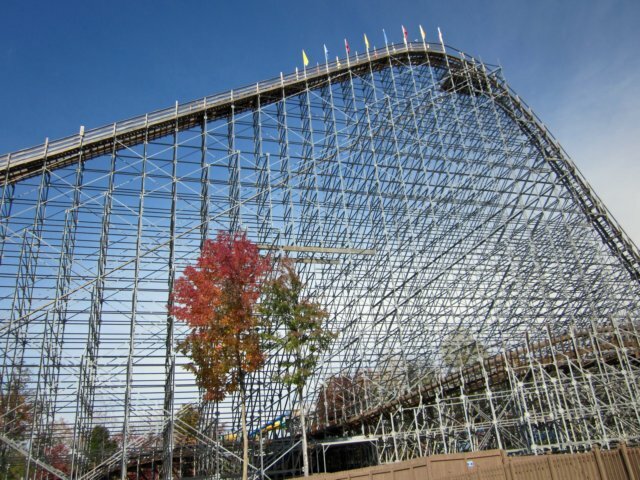 I see another roller coaster calling me. The Legend is the park’s second wooden coaster, built by Custom Coasters International in 2000. It is based on the Legend of Sleepy Hollow and you race through the woods as if you are being chased by the Headless Horseman. 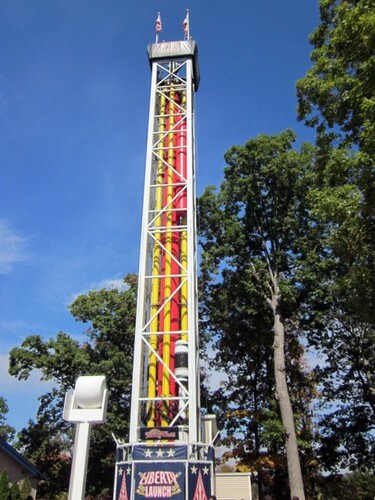 The ride has four tunnels and a unique spiral first drop that creates a constant lateral force. Like so many things in the park, the ride fits well with the surroundings and the landscaping is great. 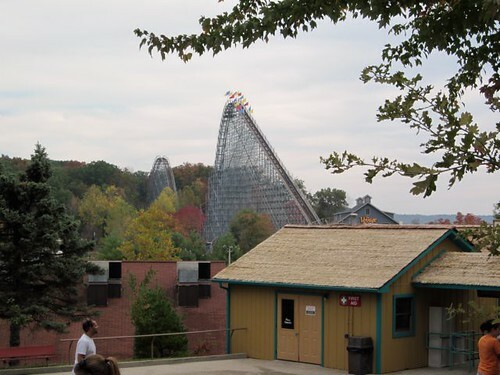 As move on towards the newest section in the park, something stands out in the distance. 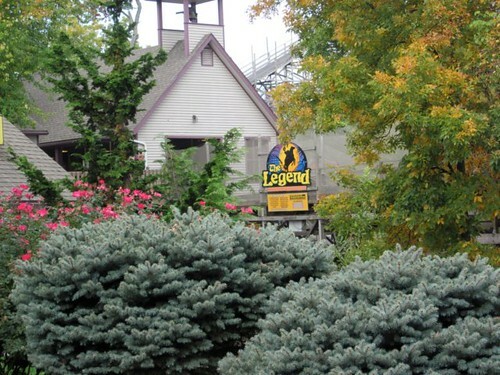 Look at the fall colors coming to life on the trees! 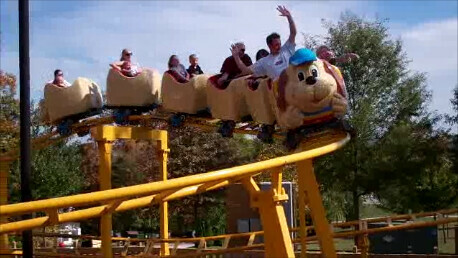 Back here you will find familiar rides like the Turkey Whirl, a Tilt-a-whirl style ride themed like Thanksgiving. 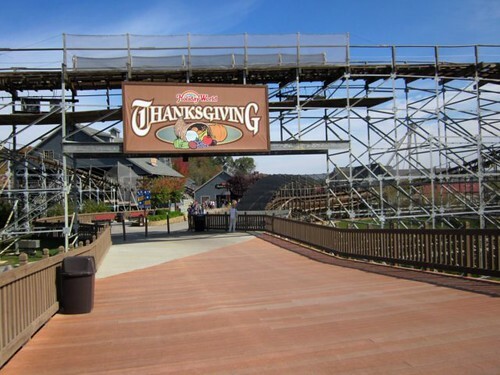 Since you are sitting inside the turkey, wouldn’t you be stuffing? 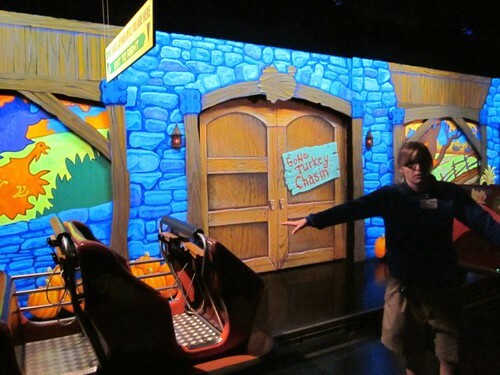 Also in this area is Gobbler Getaway, a newer interactive dark ride made by Sally Corporation. You use turkey calls to help farmer Cornelius Van Snoodle round up his escaped turkeys. Pilgrims Plunge is arguably the most unique looking ride in the park, and was the world’s tallest water ride when it debuted in 2009. 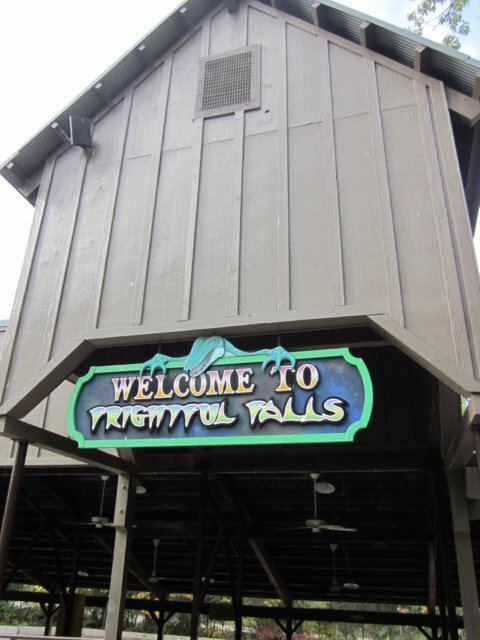 It is manufactured by Intamin and has an open air elevator that takes your 10-passenger boat 131 feet in the air to the top of the flume. 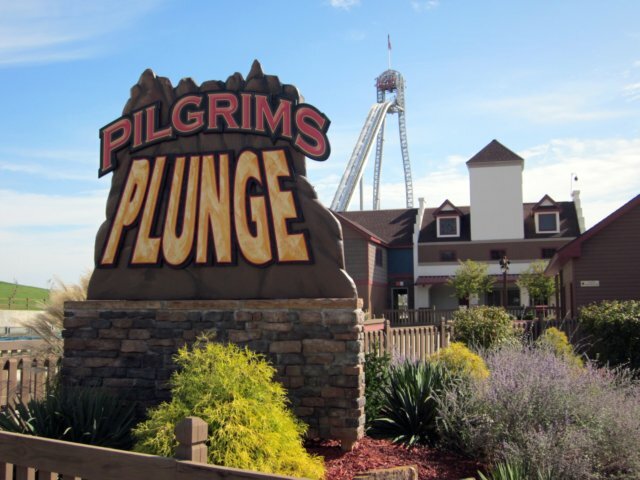 You pause briefly before dropping back down 131 feet at a 45 degree angle to the waiting water pool below. You will get wet so don’t try to hide. 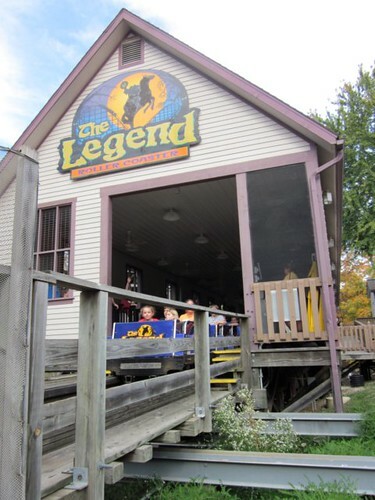 While all the rides are great, the star ride for coaster enthusiasts is the Voyage. Don’t be fooled by the steel support system, the track is clearly wooden and the ride is truly a wooden coaster experience. If you look in the lower right of the screen, you can see one of the 90-degree banked turns. 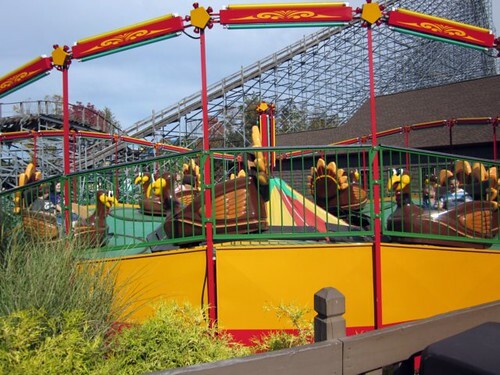 The Voyage has won the Golden Ticket Award for the best wooden coaster on the planet for the past six years. After experiencing it a few times, I can see why. The ride is intense from the time you start down the first hill at an astounding 66 degrees until you hit the final brake run. 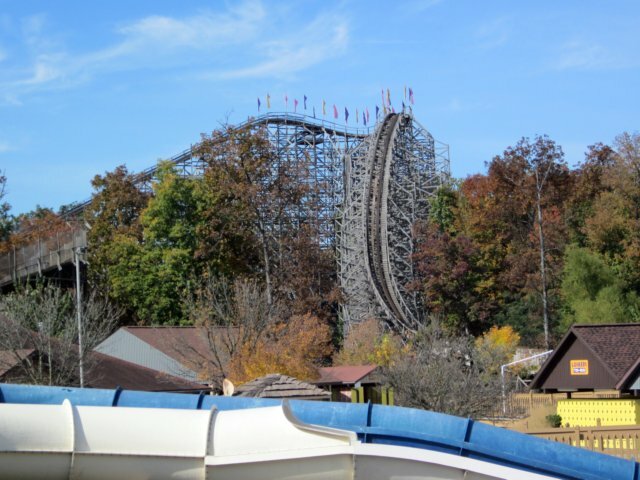 While it has a traditional out-and-back layout, the ride is anything but traditional with over 24 seconds of air time, three 90-degree banked turns, and eight tunnels, five of which are underground. But I can’t tell you more, you really have to go and experience it for yourself. By now you must be getting thirsty. 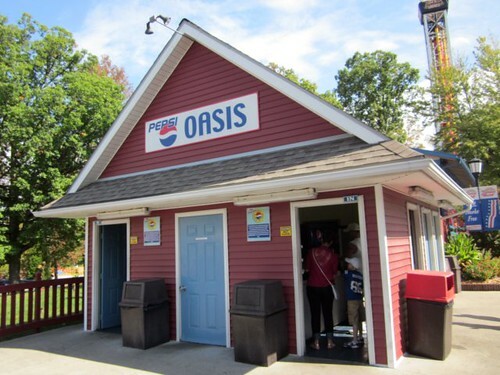 No worries, there is sure to be a Pepsi Oasis nearby. 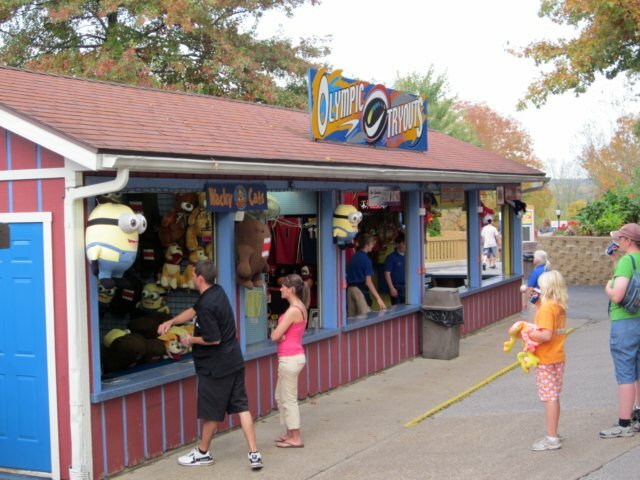 Leave your purses and wallets behind, soft drinks are free all day long with your paid admission to Holiday World. You can’t beat that. Now that we’re refreshed, we head to the Fourth of July section of the park. 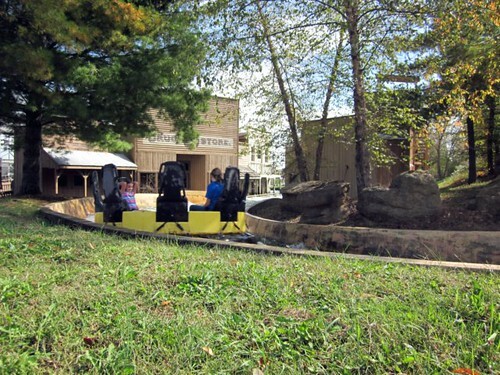 It starts out with a ride on the Raging Rapids. What I found neat about this ride is the flooded town that you journey through. There are plenty of games to play along the way. And of course my favorite stand. 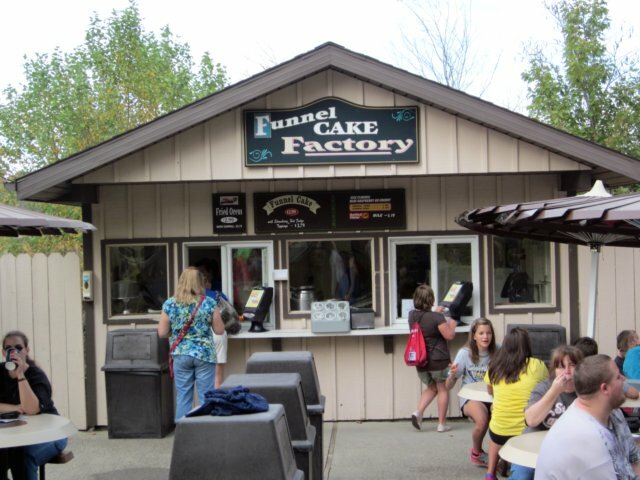 Who doesn’t love fresh funnel cake or fried Oreos? Flyers are always great fun and Eagle’s Flight was no exception. Revolution is in a nice shaded setting and was thrilling plenty of riders that day. 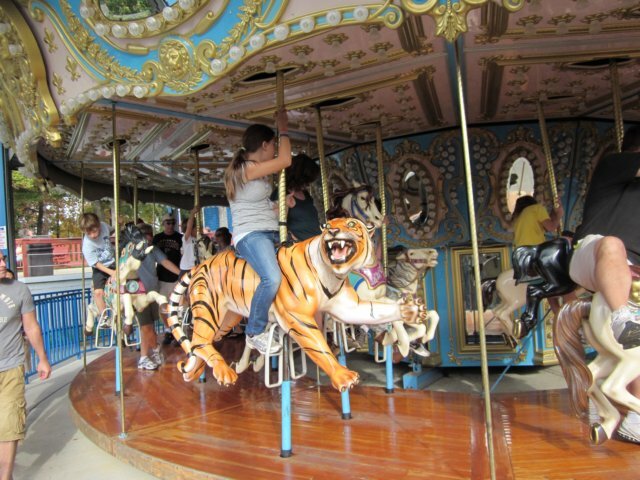 It’s not a ride that my equilibrium can handle but I wish it could. This was the last day for Paul Revere’s Midnight Ride. I guess it could be called Paul Revere’s final ride, today. 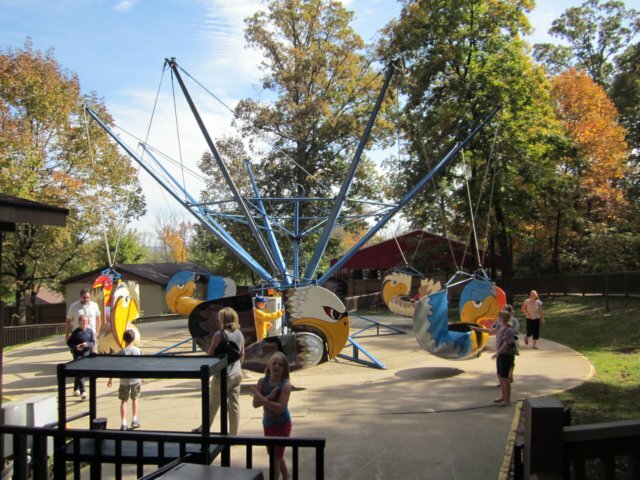 It is being retired after many years of great rides to visitors of Holiday World. 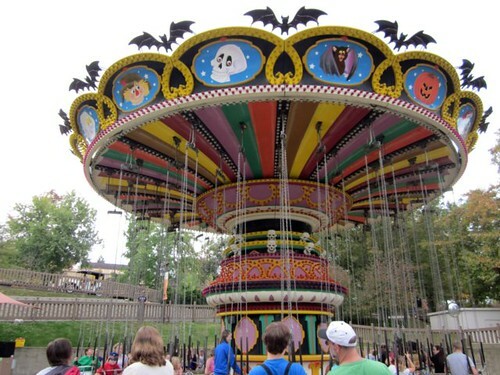 My son particularly loved this ride. Perhaps they will donate it so I can put it in my back yard? The Star Spangled Carousel is being moved to the Paul Revere’s Ride location over the winter. A new 65 foot high vertical swing ride will be installed where the carousel currently sits and will open on May 5, 2012. 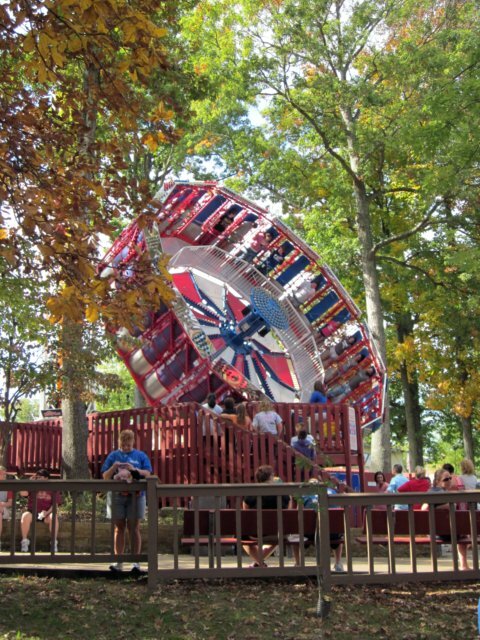 Your day isn’t complete without a ride on the Liberty Launch. 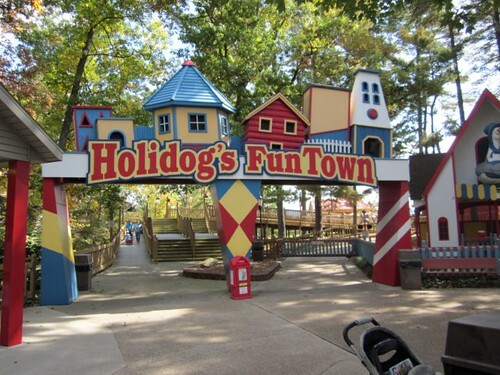 If you have smaller kids, you’ll want to stop by Holidog’s FunTown. It is circled by The Freedom Train, a 1/8th scale replica of a Baltimore and Ohio locomotive that has been providing young ones a journey through Mother Goose Land since 1946. 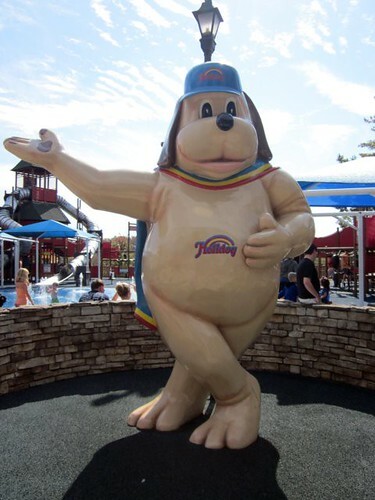 What would Holidog’s FunTown be without Holidog? In this area is a large playground with some Magic Waters erupting from the ground. 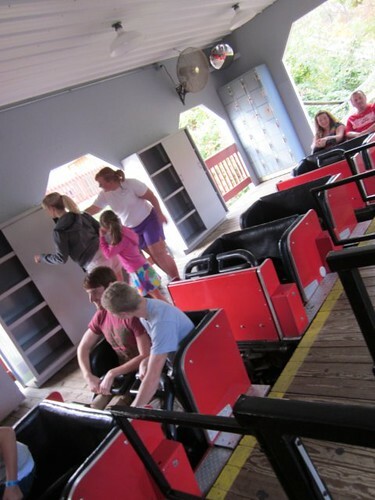 Not to be missed is the family roller coaster, Howler. This is especially good for kids of all ages that are over 36″ tall. Unfortunately the day was drawing to a close. Employees were around to thank you for coming and surround you with bubbles. Even owner, Pat Koch was there (seen in the black jacket) to thank guests. We were honored to have her blow bubbles for our son. Holiday World is a must-visit theme park for everybody. 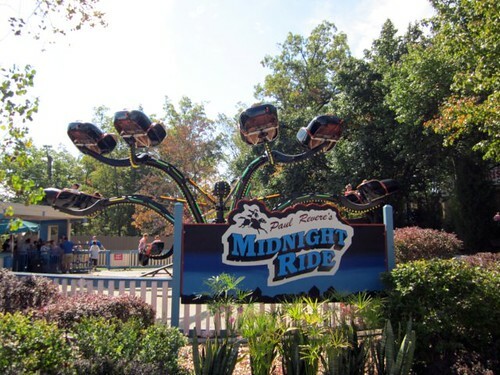 It has a wide assortment of rides and attractions and is a very affordable vacation option that includes free parking and drinks. The food is good and average-priced for an amusement park. 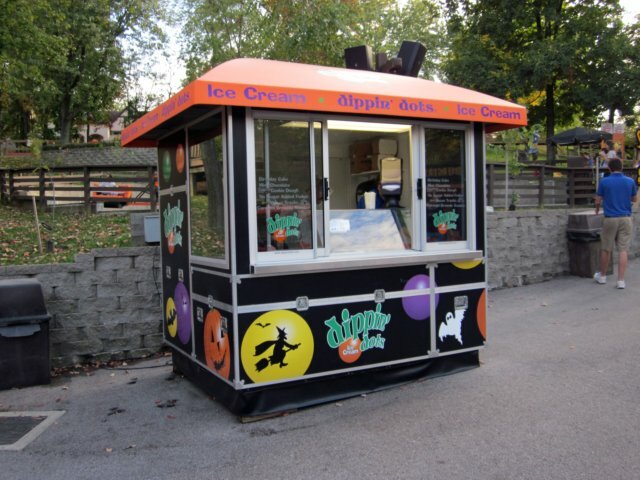 The staff is super friendly and helpful and is sure to make your trip special. Please enjoy the video of our trip. Tagged Holiday World, IN, The Voyage.